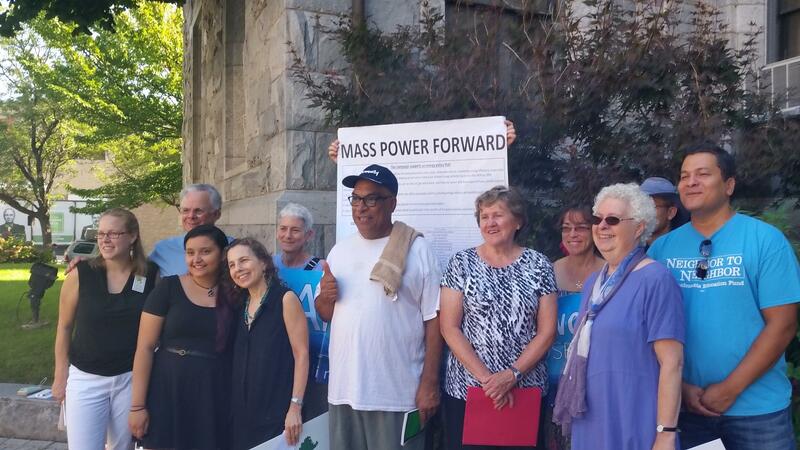 Members of a new clean energy coalition held a news conference outside Holyoke City Hall. With the Massachusetts Legislature set to take up energy bills in the fall, advocates for clean energy are mobilizing across the state. A new coalition of activists was launched today. A coalition with more than 80 members from across the state, including environmental organizations, solar power businesses, neighborhood activists, and religious congregations, was announced at simultaneous news conferences Wednesday in a half dozen Massachusetts cities including Holyoke. Claire Miller of Toxics Action Center, one of the founding organizations, said the coalition members have endorsed a five-point agenda advocating local, clean, renewable energy.
" We have a vision for Massachusetts in which children don't grow up with asthma from living near polluting energy sources," she said. "We should continue to be a leader in solar and wind." The coalition, which goes by the name Mass Power Forward, includes national organizations such as the Sierra Club and Appalachian Mountain Club, Environmental League of Massachusetts, and several local concerned citizens’ groups formed to fight such things as fossil fuel power plants and natural gas pipelines.
" It just became obvious as the state legislature was considering major energy policy that we needed to knit together and everyone was ready," said Miller. The new group’s immediate focus is on a September 29th Statehouse hearing when several energy bills will be discussed. Among the bills the legislature will take up this fall are ones filed by Gov. Charlie Baker and State Senator Ben Downing of Pittsfield that address, in different ways, the net metering cap on solar power generation. State Rep. Aaron Vega of Holyoke said he looks forward to working with the new coalition.
" I hope this coalition will stay strong," said Vega. " We are not always going to agree, but you need to be the eyes and ears on the ground in the community so we elected representatives can hear all sides of every issue." Carlos Rodriquez from Neighbor to Neighbor said local groups joined with national ones to call for the shutdown of the region’s last coal-fired power plant, Mount Tom Station in Holyoke, that closed last year. He said closing the plant reduced air pollution that affected the health of people in the Pioneer Valley and also eliminated climate altering emissions. Pointing to Hurricane Katrina,and Superstorm Sandy, Rodriguez said " Climate change is real. It is here." The coalition’s platform calls for a state energy policy that reduces climate change pollution by no less than 80 percent by 2050. Also speaking at the Holyoke news conference was Jed Proujansky, a member of the board of selectmen in Northfield, who spoke against the controversial natural gas pipeline proposed by Kinder Morgan.
" Your actions, or lack there of, will determine what happens. Neutral does not exist," he said. Mary Ann Babinski has led neighborhood opposition in Westfield for eight years to a proposed gas-fired power plant. News conferences to launch the coalition were also scheduled in Pittsfield, Boston, Fall River, Peabody, and Weymouth. State and local leaders Tuesday celebrated a solar array expected to power every single municipal and school building in North Adams. An environmental advocacy organization is campaigning in Massachusetts to drum up public support for ending restrictions on a solar power incentive program. Dozens of solar power projects in Massachusetts have stalled because limits have been reached on a program that compensates the owners of large solar arrays, according to an activist, a Co-op Power company executive, and a municipal official who spoke Tuesday on the steps of Springfield City Hall. The city of Northampton, Massachusetts is planning a number of solar power projects that would further reduce the city’s carbon footprint, while providing a new source of revenue. As soon as this summer, Northampton is likely to join dozens of other municipalities in the state that have turned old landfills into solar farms. And, in what appears to be a first in western Massachusetts at least, solar arrays may pop up at some municipal parking lots, according to Chris Mason, the city’s energy officer. President Obama is proposing the toughest regulations in U.S. history to combat climate change. Researchers say the president’s plan to reduce power plant emissions would also have a substantial and immediate impact on people’s health. The Mount Tom coal plant is now retired. The last coal-fired power plant in western Massachusetts shut down late last year. A discussion about what should be done with the plant will continue later today in Holyoke. Holyoke city officials and local activists, who hope to influence the plant’s future use, are promoting a community workshop scheduled for tonight as part of a reuse study for the Mount Tom Power Plant. Opponents of a proposed natural gas pipeline that would run through Pennsylvania, New York, Massachusetts and New Hampshire are pledging to continue protests until the plans are dropped.